March 5, 2012, Houston, Texas ~ TM Fred Texas (Burning Sand x Queen Kong by Kong) capped a stellar racing year as he was awarded Horse of the Year, the crown jewell of the Sheikh Mansoor Bin Zayed Al Nahyan Global Arabian Flat Racing Festival Darley Awards. 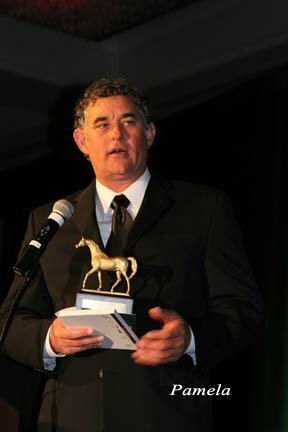 At a glittering ceremony held at the JW Marriott in Houston, the 25th anniversary of the Darley Awards, the ‘Oscars’ for Purebred Arabian racing in the US’ – Burning Sand bred horses received awards in three categories: Best Best 4 year colt – TM Fred Texas, Best 4 year old filly – Sanddpiper, and Best Older mare – TM Super Bird. 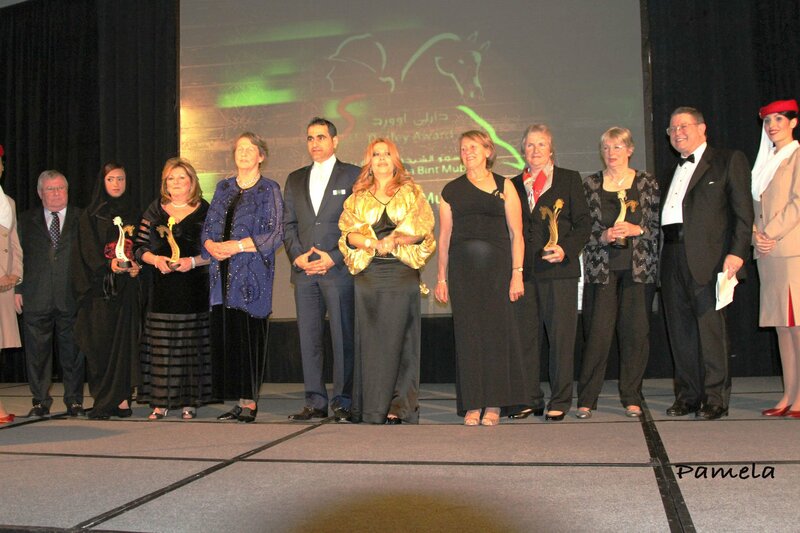 New International categories were added to the Awards as the HH Sheikha Fatima Bint Mubarak Darley Awards. Sheikh Tahnoon Bin Zayed Al Nahyan, was honored, as Golden Odessy was named Best 3-year-old filly while Dixie Valentine won the Best Mare award in The HH Sheikha Fatima Bint Mubarak Darley Awards which honors females in Purebred Arabian racing. Under this category, Margreet de Ruiter-Floor from the Netherlands was honored as Owner, English trainer Gillian Duffield was named Best Trainer, and Omani jockey Azhar Al Wardi won the Best Jockey award. 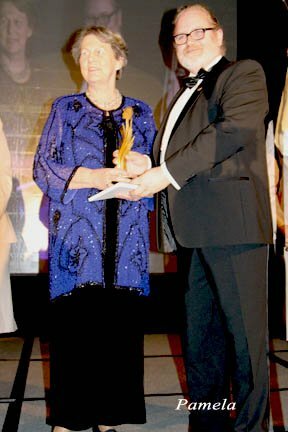 Australia’s Maureen Milburn won the prestigious HH Sheikha Fatima Bint Mubarak Darley Lifetime Achievement Award for her service to Arabian racing and received a standing ovation. Over 200 guests from all over the world attended the awards ceremony which was being held under the umbrella of the HH Sheikh Mansoor Bin Zayed Al Nahyan Global Arabian Flat Racing Festival. HE Omar Al Shamshi, Deputy Chief of Mission at the UAE Embassy in the US, welcomed the gathering. “The introduction of the HH Sheikha Fatima Bint Mubarak Darley Awards is a visionary move and reflects the role played by HH Sheikha Fatima in giving equal opportunity to women all over the world. I thank HH Sheikh Mansoor bin Zayed Al Nahyan, Deputy Prime Minister and Minister of Presidential Affairs for promoting the Purebred Arabian breed of horses and its activities,” said Al Shamshi. Ms Lara Sawaya, Director of the HH Sheikh Mansoor Bin Zayed Al Nahyan Global Arabian Flat Racing Festival, placed on record the Festival’s activities and thanked all those involved in the Awards ceremony. Apart from HE Al Shamshi and Ms Sawaya, Abdul Mohsin Al Dossary, Assistant Under Secretary of Sports at the General Authority of Youth and Sports Welfare, Abdul Raheem Al Hashemi of the General Women’s Union, Talal Al Hashmi of the Abu Dhabi Sports Council, Adnan Sultan Al Nuaimi, Director General of the Abu Dhabi Equestrian Club, Ali Moosa Al Khamiri of Dubai Equestrian Club, Patrick Buckley of Abu Dhabi Equestrian Club and Stephen Bowey of Invest AD attended the awards and participated in distributing the prestigious awards. 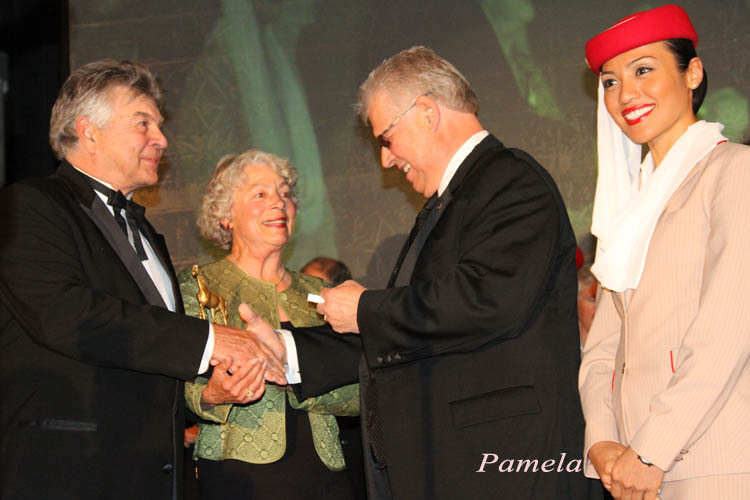 The Arabian Racing Cup was founded by Dr. Sam Harrison in 1983, and the Darley Awards were established in 1987. 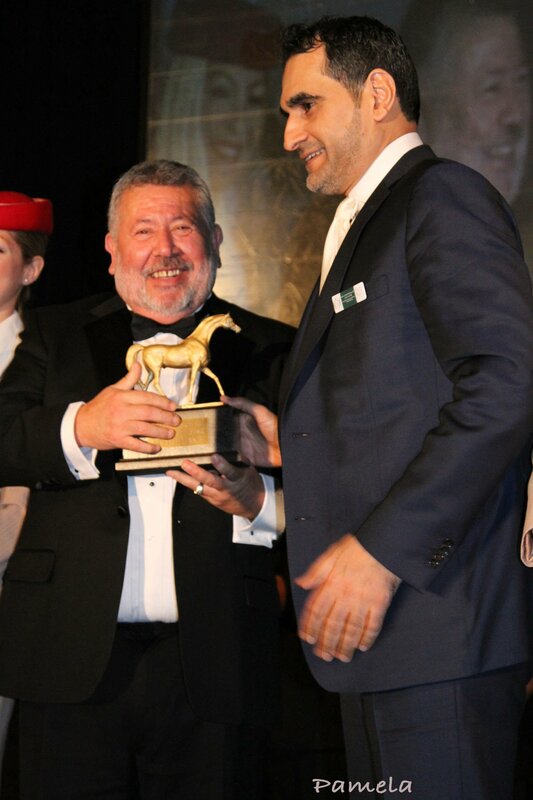 This distinguished annual ceremony is a solid tradition that has become a foundation of American Arabian Racing. The Darleys present an opportunity for those involved in Arabian racing to come together from across the nation and around the world to celebrate its virtues and award its best. 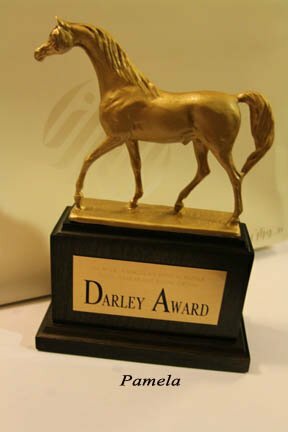 “This year’s Darley ceremony brings the awards to the level of International distinction and attention that has never been experienced in the same way. This is the fulfillment of the dream that Dr. Sam had for the Darleys, and no doubt he would relish tonight’s event”, said Arabian Racing Cup Chief Steward, Dr. Kinsman Wright. The H.H Sheikh Mansoor Bin Zayed Al Nahyan Global Arabian Flat Racing Festival is organized by the Abu Dhabi Tourism and Culture Authority and co-ordinated by Abu Dhabi Sports Council in association with Emirates Arabian Horse Society and IFAHR, supported by General Authority for Youth and Sports and Fegentri with Emirates airlines as the official carrier and sponsored by Invest AD, Al Rashid Investment, Areej Al Ameerat, Mauzan, Al Awani General Enterprises, Kabale, the UAE’s General Women’s Union, the Sheikha Fatima Bint Mubarak Ladies Sports Academy, Abu Dhabi International Hunting and Equestrian Exhibition 2012, Wathba Stud Farm and Abu Dhabi Equestrian Club.